Phonographic Copyright (p) – Bandai Namco Entertainment Inc. Copyright (c) – Bandai Namco Entertainment Inc.
"PAC-MAN" Colored Variant limited to 200 copies. The first pressing of the NAMCO MUSUEM: ARCADE GREATEST HITS LP comes packaged in a “multicade” die-cut jacket, which simulates an actual arcade cabinet bezel, interacting with the full color, heavy stock inner sleeve allowing you to display your choice of action screens from PAC-MAN, GALAGA, MAPPY or DIG DUG! The package also includes a 8-page full-color booklet featuring original arcade artwork and additional information about each game. An interesting record to say the least. 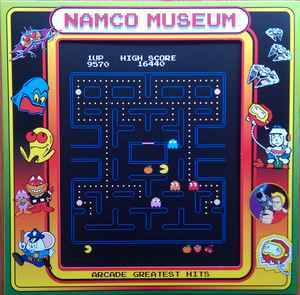 From Spacelab comes a longly teased Namco Museum release, in pretty awesome packaging. It is top notch. This comes in a die-cut jacket with an inner printed sleeve that you can switch between Pac-Man or Galaga; Mappy if you decide to put the booklet in front. The site mentions Dig Dug, however this is misleading as it's printed on the inside of the jacket, you'll only see it if both the sleeve and booklet are removed from the jacket. The booklet is nice visual candy for a minute or two while the sounds of 80s nostalgia blasts over your head. For this release, I got the Pac-Man variant. Initial photos of the record that were shown on the internet are somewhat humorous as the Pac-Man design differs from copy to copy. Mine looks like Pac-Man's jaw is extended to its limit. The audio was terrifically mastered by Mr. Peterson for the vinyl format, no complaints on that front. The pressing is surprisingly good. There is little surface noise on the record, unfortunately there is noticeably more noise as the needle transitions to and from the yellow and clear portions but it is barely noticeable, you'd have to be listening for it to notice in the silent portions. As for the audio itself, it's a mixed bag. I can understand why for the earlier games they went with the 'gameplay' recordings, with sound effects layered on top as the tracks themselves are only seconds long loops but I think they could have still done it without all the extra sounds. Also kind of odd to have the Pac-Man 'miss' sound at the end of Side II when it's already at the end of the Pac-Man track on Side I. Seems forced. I would recommend this release to collectors or listeners of video game music in general. This is probably not something you're going to put on often, maybe once and then put it away. It could be useful for a gaming party or a 80s event or even in the background as you work on something. Otherwise it is an interesting little novelty record.